Submitted by Alexander Briones on Mar. 7, 2018. To enjoy your instrument without testing the limits of people's noise tolerance, you'll want a good guitar headphone amplifier. While many conventional guitar amps have headphone outputs, dedicated guitar headphone amps are easier and more convenient since they are usually compact, portable and they conveniently plug straight to your guitar. Here we look at the best of these headphone amps for guitar, along with top rated compact guitar processors that also allow for quiet headphone playing. While there are cheaper options, Vox secures the top three spots in this list with the amPlug 2 series. Vox continues to be the number one brand when it comes to guitar headphone amps, thanks to the success of their amPlug line. Taking the top spot in this list is the Vox amPlug 2 Clean, which features good old clean tones driven straight to your headphones. Since clean tone lets you hear the nuances of your guitar playing better, it is ideal for improving your technique. It is also great for those who want to develop song ideas in places where you can't get too noisy. Other features include built-in effects (three types of chorus, delay and reverb), auto-power off, folding plug mechanism, and an aux in for jamming along with your favorite track. 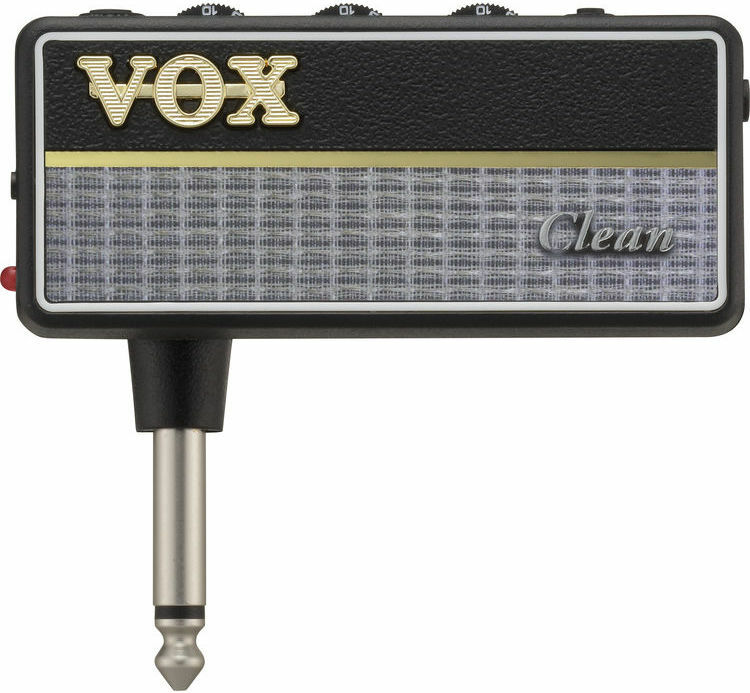 Thanks to its combination of great sound and portability, the Vox amPlug 2 Clean continues to rake in positive reviews. Bedroom guitarists love how it has helped increase their practice time, while those who constantly travel found it to be an invaluable tool for keeping their chops up while on the go. One user describes the sound as shockingly good, and this is a good representation of how it exceeded the expectations of many. There are a few who are not too happy with the built-in effects, wishing that there was a way to tweak them. Others wish that Vox develop a similar model but with built-in rechargeable battery for convenience. 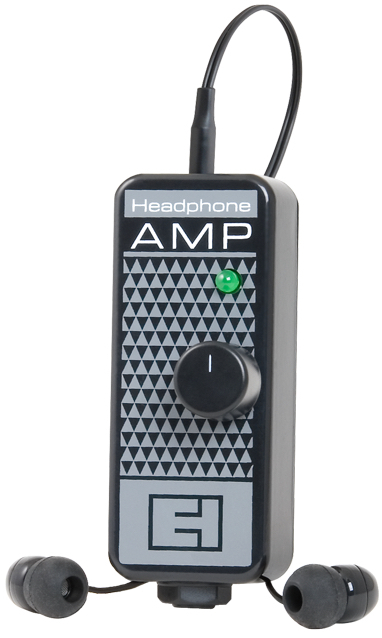 If old school clean tone is your preference, then get this top rated guitar headphone amplifier. 89 out of 100. Incorporating 325+ ratings and reviews. Regardless of ever-changing musical trends, there's no stopping the popularity of high-gain tones among guitarists. But it's not easy to get good metal tones at lower volumes, let alone when going straight to headphones. Surprisingly, Vox was able to accomplish this feat with great results, as evidence by how well the Vox amPlug 2 Meta is doing in terms of ratings and popularity. Vox describes the tone as "American high-gain" and for variation, there is a tone knob and a mid-cut mode that gives you the iconic "scooped mid" sound when you need it. Other features of the amPlug 2 Series are added in, including built-in effects, folding plug, auto-power off and aux in. Excellent and amazing are just two of the many good adjectives that consistently appear in reviews. Most users are satisfied, if not very happy with how it sounds right out of the box, describing the sound as huge, tight and musical. While others are pleased with how it allows them to keep their metal style chops sharp, without having to setup their rig and disturb other people. There are some users who caution that the plug requires careful handling. A few describe the sound as just OK for the price, while others recommend getting headphones with good bottom end to get the most out of this unit. 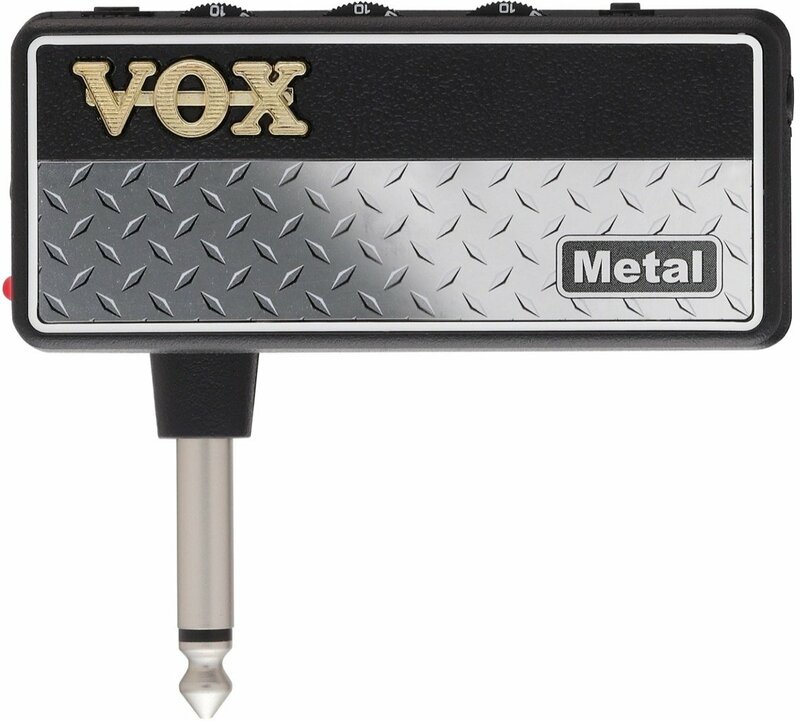 The Vox amPlug 2 Metal is a portable high-gain metal "rig" that will not disturb your loved ones. 88 out of 100. Incorporating 475+ ratings and reviews. 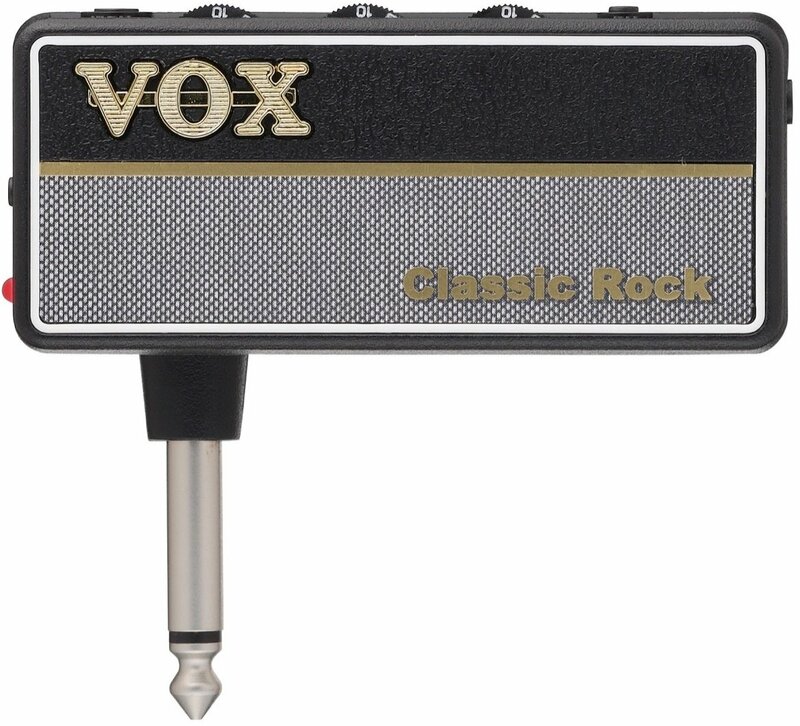 The Vox amPlug 2 Classic Rock caters to guitarists who are looking for overdriven tones that resemble the sound used by iconic rock guitarists of the past. The mids are emphasized to reproduce the crunchy rhythm tone and cutting single note lines of an overdriven tube amp. It also comes with two extra amp modes that pushes the mids further as you prefer. Adding to its tone versatility are essential effects that include chorus, delay and reverb. Finally, it also comes with a folding plug for better compatibility with different guitar shapes, battery saving auto-power off function and aux-in. Market sentiment is generally positive, with many pointing to the Vox amPlug 2 Classic Rock's overdriven tone as its strong point. Many are happy with how its tone works well with different guitar styles, be it Les Paul, Telecaster, SG, Stratocaster and more. The folding plug, which is just as versatile as its sound, also gets a lot of thumbs up. While there's not many complaints about its sound, build quality concerns came up a few times, with specific complaints about its plastic exterior. So again, careful handling is recommended. The Vox amPlug 2 Classic Rock lets you rock out virtually anywhere and anytime - without the danger of being kicked out for being noisy. Here are top rated portable guitar processors that can be used as headphone amps. Although they are not as convenient and portable as bug-type headphone amplifiers, they offer tone variety, and they can be used with a regular amp. 87 out of 100. Incorporating 250+ ratings and reviews. 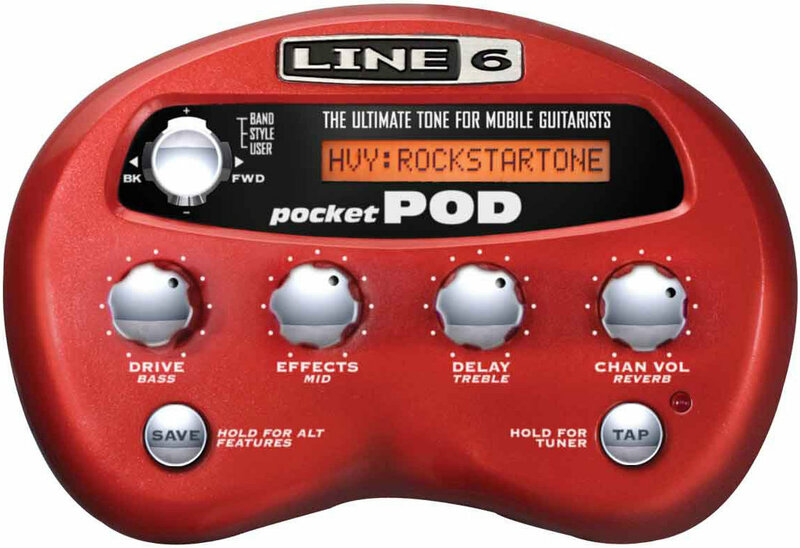 The Line 6 Pocket POD is true to its name, a compact palm size guitar processor that can fit into average size pockets. For its size it offers 32 amp models, 16 cab models and 16 effects, all of which are developed by Line 6, a prominent manufacturer when it comes to digital sound processing and amp modeling. It also comes with easy to use "presets" that cover various musical styles, more than enough to keep you busy practicing or playing with your favorite tracks. In addition, this compact unit can run on four AAA batteries, allowing for true mobile use, especially when paired with headphones. Portability is the key factor that endeared the Line 6 Pocket POD to many, most of which are musicians who want a way to play their electric guitar while they travel. Many are satisfied with its overall sound quality, especially when using headphones, while others are impressed with the unit's solid build. There are users who are not too happy with some of the effects and amp models, but they do concede that many of the essential tones sound decent, if not good. If you're looking for a pocket-friendly guitar headphone amplifier with multiple effects and amp models, then check out the Line 6 Pocket POD. 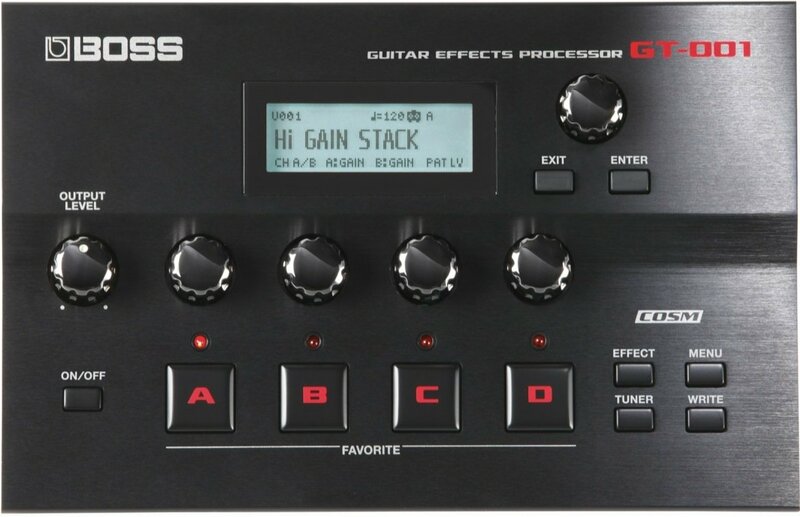 Boss takes the best features of their flagship GT-100 multi-effects pedal and compresses them all into the GT-001, a desktop guitar processor. This form factor makes it ideal for recording and practice, but more importantly, it also works nicely with headphones. As such, it comes with Boss' latest COSM technology amp models and digital effects but at a more space saving size. And since it can also double as your USB audio and Midi interface (complete with an XLR mic input), you are getting even more use out of just one unit. Dimensions: 8.3" x 5.4" x 2.3"
Users and exerts alike appreciate the simplicity and intuitive design of the Boss GT-001. Trevor Curwen of Music Radar describes it as "A convenient source of guitar sounds for recording and practice at home." While it may not be everyone's cup of tea, those who are looking for a compact desktop guitar processor have mostly great things to say about the unit. Sound quality also gets a lot of thumbs up, especially when listening through headphones where amp modeling and cab simulation really shines through. Having been made by Boss, reliability is a given, as attested to by experts and regular users alike. As expected, there are some purists who are not impressed with the unit's amp modeling quality, while others are not too happy with the side mounted ports which limit the units position on a desk. Boss hit multiple birds with the GT-001, a powerful guitar processor, recording interface and headphone amplifier - all in one package. There are times when complex tools can distract, if not totally derail your practice or creative processes. This is the reason why many still prefer straightforward gear like the Electro-Harmonix Headphone Amp, a portable unit that lets you play your instrument through headphones - nothing more and nothing less. It's a compact box with a belt clip that's powered by a 9V battery, with basic input and headphone out jacks, and a simple volume control. What makes it interesting is how it is designed to handle pedalboards, which can be nifty if you want to practice quietly while still using your performance rig. Finally, it is built similar to their nano-size pedals, with a metal exterior for reliability and longevity. Simple, reliable and effective are three words that nicely summarize what many feel about the EHX Headphone Amp. Many of its commendations come from users who are happy with its one volume knob operation, while others are impressed with its reliable tank tough build. Some users describe it as having a warm sound that complements the sound of guitars and pedals. Even bassists are impressed with how it can reproduce lows through the headphones. The lack of a battery compartment turned off a few users, although there are others who are happy with having to screw and unscrew the case for improved reliability. And it's no surprise that those who are looking for more tone options will not be content with its simplicity. If you're looking for a streamlined approach to playing through headphones then get the Electro-Harmonix Headphone Amp. There's really no substitute for the feel and vibe of a cranked guitar amp, but since people around us have limited noise tolerances, we won't always have this privilege. While some amps do have headphone outputs, they are not as convenient as headphone amplifiers. And sometimes, the convenience of quick plug and play use, and the ability to play your guitar on your bed, or while walking around, can inspire you to improve your skills and generally make better music. This is the reason why it is practical to have both, especially if you want to increase your productivity and practice time. Headphone amps come in many different forms, but the most popular ones are compact bug-type units that directly plug into your guitar. These are favored for ease of use and mobility, the downside being the need to regularly replace/recharge batteries. Compact box type headphone amps (usually with belt clips) are also mobile, but require an extra cable to connect to your guitar. We've also included floor and desktop based guitar processors because they can provide the same headphone amp functionality with the added benefits of digital sound processing and more - albeit with some limitations to comfort and portability. Speaking of portability, this should be your priority if you're always on the move. Bug-types are ideal, just remember that they need a bit more handling care, and they can be easily lost if you're not careful. The compact guitar processors we included here are reasonably light and compact, but they will usually require dedicated bags, or storage spaces for transport. While it's unreasonable to expect studio quality tone from headphone amps, many of them will provide usable if not good sounding tones. It is important to get your guitar sounding good to your ears, because sound quality will affect your playing experience. Thankfully, guitar headphone amps are designed to compliment the sound of electric guitars, many of which even come with familiar amp voicings - like Classic Rock, Metal, Clean and many more. So make sure to get one that sounds close to the style and voicing that you prefer. Having extra features can be a good thing, especially if they can promote better playing technique, longer practice times, or more productive music production. Features like aux input allows you to play with tracks to keep your timing skills up. The same can be said with metronomes, auto-accompaniment or built-in rhythms, as well as loopers. The ability to quickly and conveniently record your playing also helps a lot in terms of checking and improving your technique, or for storing song ideas. On the flipside, if you just want something straightforward, then extra features can be distracting. At the end of the day, you have to know what you need and get one that fits the role. The quality of your headphones will play an important role in terms of sound and comfort. This means that when buying a guitar headphone amp, it is best to consider your budget for good headphones along with it. While cheap earphones and headphones can work, they usually lack low-end, resulting in thin sounding tones. Check out our roundup of the best headphones if you want more information on good headphones. Submitted by Les (not verified) on Jun. 8, 2018. Had two VOXs, had. They are cheap made and break easy. Need one with a metal case for a mobile device. My favorite is the NUX PG2. Submitted by John (not verified) on Jul. 16, 2018. Submitted by Jason Horton on Jul. 16, 2018. The PG-2 does have some good reviews, but we haven't short-listed it because the manufacturer has discontinued production. Today we removed the following item from our recommended list above due to a lack of availability, but you can still read our analysis of it: Zoom G1Xon.